Welcome to the Bitiwend wireless doorbell Review! As part of our wireless doorbell reviews, we decided to take a look at the Bitiwend wireless doorbell to see what this minimalistic wireless doorbell has to offer. 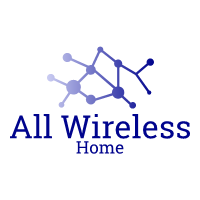 It is great to have this much choice, especially if you are looking for an expandable wireless doorbell with more than one receiver. This choice needs to be made at the point of purchase. 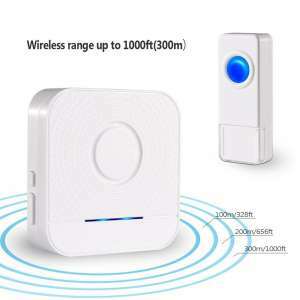 The advertised distance for the Bitiwend wireless doorbell is 1000 feet (300m), which means you are likely to get around 50% when installing in your home. 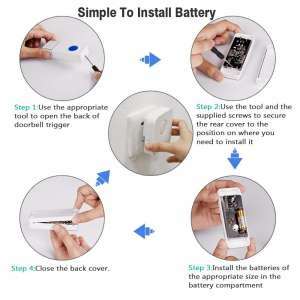 You have to remember that there are many obstacles between your wireless doorbell push button and receiver. Walls, doors, other electrical items, and floors will weaken the wireless signal as it passes through them on the way to the receiver. That being said, 1000 feet in the open air will give you more than enough distance capabilities for a regular size home. There are 52 different ringtones to choose from! Of the 52 chimes, you are only likely to like a small amount! If you are like me, you will go through the entire list before settling on the classic ‘ding dong’. Having said that, it is nice to have such a wide variety of chimes to choose from. The volume range is 25dB-110dB which is more than enough volume for a regular size home! The volume can be set using 1 of 4 volume levels. If you are deaf or hard of hearing then the Bitiwend wireless doorbell, along with the LED flash when the button is pressed, needs to be considered. Whilst there are louder wireless doorbell options (some hitting 125dB! ), 110dB is simply loud enough! 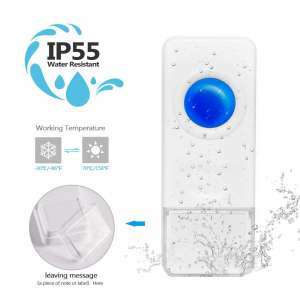 In terms of being waterproof, the Bitiwend wireless doorbell is rated IP55, which is one of the best options, and ensured that the push button is not damaged when exposed to the rain. More details about the IP rating can be found on our waterproof wireless doorbell post. The working temperature range for the Bitiwend wireless doorbell is -22°F to 158°F (-30°C – 70°C). It really is a complete weatherproof wireless doorbell! Cold, or hot, Sun, or Rain, the Bitwend wireless doorbell has you covered! Wireless doorbell installation is very, very easy and you can expect the same with the Bitiwend doorbell. Please plug one receiver into a regular socket, and pick the sound you want on this receiver. Press and hold the volume button on the receiver for about 5 seconds, the receiver will blink with a “ding” sound, then immediately push a transmitter to pair with the receiver. Finally, you will hear the music you set. It is the same operation method to pair other transmitters with receivers. The Bitiwend wireless doorbell has a 12-month warranty and a worry free 30 days money back guarantee! In terms of confidence, it really shows that the manufacturer has it in abundance if they are willing to offer both options. After reviewing the Bitiwend wireless doorbell, we had no hesitation in adding it to our list of the greatest wireless doorbells for your home, office, or apartment. The minimalistic design, multiple chime choice, and loud volume mean it scored very highly on this review. Another great feature is the ability for any visitor to leave a note within the push button. I know it will rarely be used but it is a nice option for them to have. If the Bitiwend is not for you, check out our other wireless doorbell reviews! Live the door bell. But it would be nice if you could change the music / chimes on a app. The Bitiwend wireless doorbell needs to be considered for many different reasons. Firstly, it is a modern, minimalistic design that is sure to look good in your home. Not only that, but you also have a great wireless doorbell for many situations, including (but not limited to) a waterproof, weatherproof, loud option that also need to be considered if you are deaf or hard of hearing. 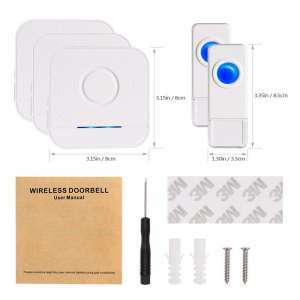 If you are looking for the best loud wireless doorbell then we have you covered in this post. We have 5 of the best, with a maximum volume of up to 115dB!